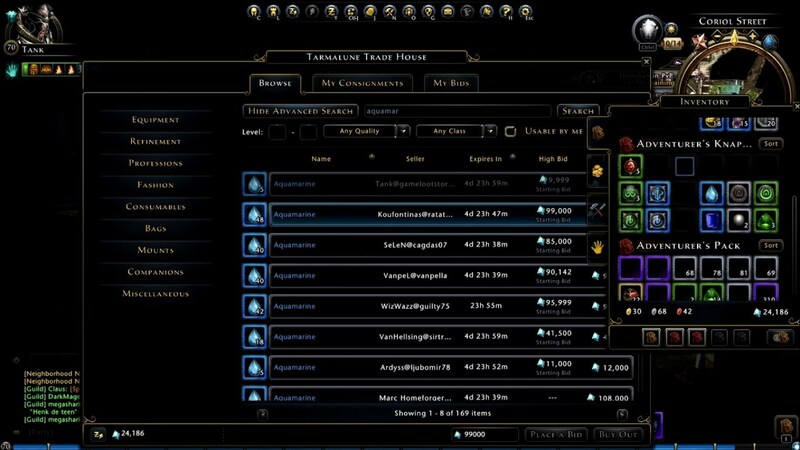 Astral Diamonds are a form of in-game currency in Neverwinter. It cannot be directly traded between players, but it can be used as trading currency in the Auction House to buy or sell items. So how to get Astral Diamonds? Here are the best ways. 1). A skirmish gives you half AD compared to dungeons. It will give you 5.000 Rough AD each run (more if you have some bonus) for 2 times a day Cloak Tower dungeon. Every Monday you have one 4.500 Rough AD mission on each Campaign. And also remember to grab the key from the vendor and open the chest at the end of one of those runs. After both you should have enough Seals of Adventurer to purchase a 500 RAD bag from Seals Vendor. 2). If you are levelling your first character and you want AD to buy stuff to help. All you can do is, invoke, do two dungeons, cloak tower is quickest and easiest (partly because its full of level 70s doing the same thing), just run forest run. Then do two skirmishes. Although it is probable that invoking doesn't give AD, it does give a bonus AD if you earn it from an activity. Each time you invoke, the bigger the bonus. 3). The only other thing is playing the market, but that is tricky if you have no AD to start with. Its tricky when you do. 4). If you have VIP sell whatever inner box drops out of the lockbox. 5). Be warned there are suggestions to hold salvage for 2XAD events. That is fine advice on consoles, on PC not so much. On consoles these come around fairly regularly, on the PC there may be another one, one day. 7). Shores of Teurn and Prophecy or throne. Shores always rewards 1 lvl 70 blue that can be salvaged (sometimes 2). Prophecy of madness as well as Throne of the dwarven gods has a chance to drop rings. (If you use demonic keys you always get one) Save all the items until x2 AD and store all of them on your other toon for more inventory. By the way throne goes faster but drops different rings than prophecy of madness depending on your class you can farm for the +4 &+5 rings you need. You may know some of the ways. Hope the ways from community can do a little help. You can also buy Astral Diamonds from our online store neverwinter-diamonds.com.